BERKELEY, Calif.— In a cool, early fall Saturday night in northern California, the No. 19 Oregon Ducks came into town to take on the No. 24 California Golden Bears in a Pac-12 conference battle. There was certain energy in the brisk air; fans, alumni and students all seemed to buzz anticipating the game. According to Las Vegas odds match, this one should have been a close game. Oregon was a 2.5 favorite, but this game would not be as close as predicted. 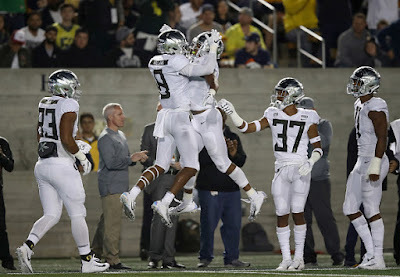 The Ducks churned through the game making big play after big play on their way to a 42-24 win over the Golden Bears. The Ducks played with an undeniable will, fresh off a tough loss to Stanford last week. “We really switched where are motivation came from. The motivation was not provided externally for our program,” Oregon coach Mario Cristobal. "It wasn’t about any outside element. We built it internally from the inside out”. The Bears started the game by marching up the field on a 15-play, 72-yard drive. However, they would be stalled and forced to kick a field goal because of Oregon’s bend but don't break defense. The Ducks made their first drive appear flawless getting production on both the ground and through the air. Junior quarterback Justin Herbert threw four passes and completed them all. Capping the drive with Herbert connecting with senior tight end Kano Dillon on a corner route scoring from 30 yards out to go up early 7-3 in the first quarter. “Justin, you are going to hear me say it every single week. He just continues to elevate his game. He sees it, he sees the whole field. He is a great decision maker. Cristobal said of Herbert. Herbert finished with 225 yards and two touchdowns. “He was on point 99 percent of the time today. Just another impressive showing by Justin,” Cristobal said. California freshman quarterback Chase Garbers threw an interception on the second drive of the game as the pass was picked off by senior defensive back Ugochukwu Amadi near midfield. A quarterback switch would be made in the second quarter in sophomore Brandon Mcllwain. McIlwain ignited the offense going on an 11-play, 90-yard drive., capped off by a Mcllwain scamper for a touchdown on a 28-yard run. Travis Dye and the Ducks answered right back with score on a 45-yard run to give the Ducks a 14-10 lead in the second quarter. Herbert continued the onslaught by throwing a 36-yard touchdown on a four-play 81-yard drive. Dye finished the game with 115 yards on 20 carries. “Travis, he showed up big and we’ll continue to depend on him.” Cristobal said. A 28-10 lead was taken into the second half as it began the way the first left off for the Ducks— with a big play. On the first play from the line of scrimmage, freshman running back CJ Verdell picked up a huge chunk of yardage on a 74-yard run. Getting tackled at the Bears one-yard line. Oregon's offense would not be the only shining part of their team tonight. The defense seemingly every time would thwart drives once the Bears began getting momentum. Freshman Jevon Holland grabbed an interception in the end zone for the Ducks. California had some bright spots, but mainly be from Mcllwain. Notably, is the first Cal quarterback to go over 100 yards rushing since 1958. Mcllwain ran for 123 yards while throwing for 128 yards. Oregon gets a week off. When they return to action, they play host to the visiting Washington Huskies (4-1, 2-0). The Huskies are riding high after a blowout 35-7 victory over the BYU Cougars on Sept. 29. California heads to the desert to play the Arizona. This mark the 34th time they face off head-to-head. The Wildcats enter the game looking to redeem the loss to the USC Trojans and get back to a .500 record.